Curl Keeper Original 8 oz., Silk Shampoo 8 oz., Tweek Cream Hairspray 8 oz. & Curl Keeper Gel 1 oz. If you have curly hair you want it straight. If you have straight hair you want it curly. Often, we want what we don’t have. I have been “blessed” with both – a combination of the two – but not necessarily in a great way. In between curly locks and stick straight is, you guessed it, frizz! I have found a line that wins the frizz fight every time, no matter the weather. Meet Curl Keeper, my new favorite anti-frizz haircare. NOTE: They are refreshing their brand, so for now, you can still find their stuff as Curly Hair Solutions (just to keep you on your toes). So many products promise to be humidity-resistant or smoothing all day. My experience has been that they don’t live up to the hype. I’ll walk outside, and if the weather conditions aren’t just so, my hair takes on a mind of its own! I am absolutely loving Curl Keeper’s Slip, which detangles and helps to seal in my colored hair. I condition in the shower but always have knots. It’s like my hair is shinier and healthier; smoother, too. My other new go-to is ReMane Straight. It is the BEST straightener/smoother I have found to date. It does its job and protects my hair from heat, and my fine hair needs that. It’s like my hair is all of a sudden better-behaved. 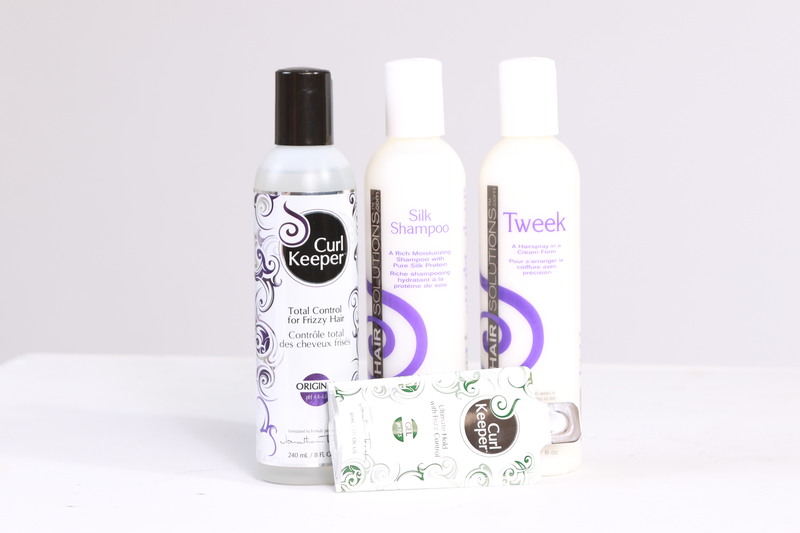 Slip Detangler 8 oz., Curl Keeper Original 8 oz., Silk Shampoo 8 oz., Tweek Cream Hairspray 8 oz., Curl Keeper Original & Gel 1 oz. Silk Shampoo 8 oz. & Tweek Cream Hairspray 8 oz. I decided to put my naturally curly-haired friend to the test. She tried the Curl Keeper Gel and was super impressed with the results (there’s also Curl Keeper Original that has the texture of a serum). Notoriously, curly hair tends to be dry. My friend noticed instantly that it felt soft and “in control”. Important for crazy curls, to let them know you’re in charge! Well, her ‘do was fresh and fun. We had a much needed GNO and her curls kept up with us all night long. Love your bouncy, defined curls. Or love your touchable, smooth, sleek hair. Be frizz-free and fabulous! And beautifully you. This entry was posted in Curly hair and tagged anti-frizz haircare, curly hair products. Bookmark the permalink.